Enter the mystical Shaman's Dream. This 5-reel slot game features totems, tomahawks, & dream catchers for magic jackpots! Shaman’s Dream Slots has a fantastic fantasy theme which can be enjoyed by a whole range of online slots game players. Developers have taken significant amounts of time to create a really beautiful feel to this slot with loads of mystical Native American symbols across the reels. This adventure-themed slot is packed with fitting symbols across its 5 reels. These include wolves, tomahawks, wigwams and totem poles. Shaman’s Dream features 25 potentially winning pay lines and many bonus features. To win the jackpot you need to line up five White Wolf symbols across your pay reels, as the Wolf is your Wild symbol and the jackpot on offer is usually around 9,500 coins. The slot game also features the Dream Catcher Scatter symbol. Line up three or more of these across your reels and you’ll activate the free spins round where there are 15 big spins to enjoy and these can of course be reactivated if you’re very lucky. 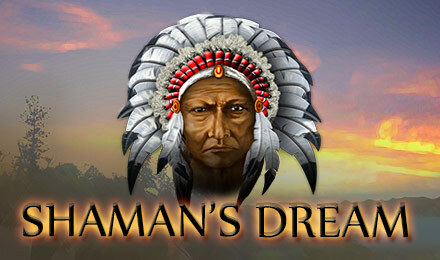 For an adventurous slot game with a mystical feel and great bonus rounds, Shaman’s Dream Slots is definitely worth a go.